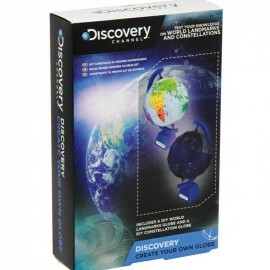 Discovery Channel Create your own globe - spacekids - space toys, dressing up costumes, kids spacesuits, astronaut food, cool space stuff! 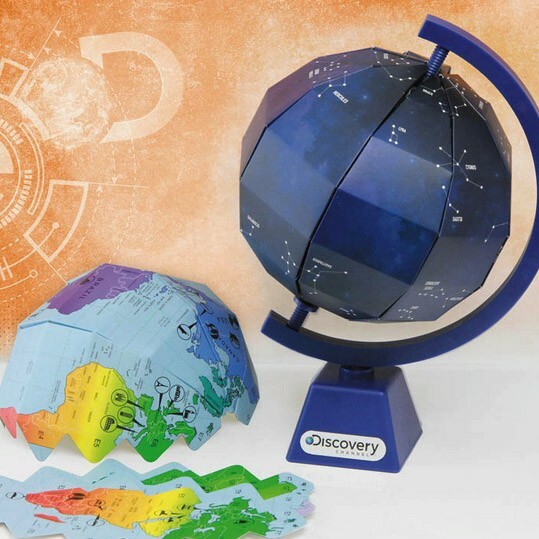 Be the master of your own creation with this Create Your Own Globe set. Containing everything you need to build your own personalized version of the Earth either with landmarks or a star map, this is a unique gift that really does allow you to change the world your way. A build your own set, the globe comes with everything you need to construct your own stand and axis, plus two different globe maps representing day and night for you to fix and slot into place. The 'day' map features a standard map of the Earth, with all the world's major landmarks labelled. The 'night' map is based on the night sky, and features the major star constellations accurately portrayed and labelled, for an impressive alternative to the standard globe. Both maps are easy to assemble, with double sided tape and instructions provided.